This is actually (after the Group 5 Montecarlo Turbo) the second evolution of the Beta Montecarlo. Again only the centre section of the road car was used with additional subframes for the front and rear suspension and a longitudinal 2L, 16V supercharged 4 cylinder engine. 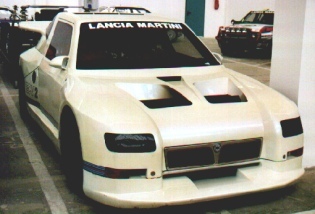 After design started in 1980, homologation of (200 built) Lancia's new rally weapon in Group B was achieved per April 1st, 1982 and Lancia starts building 20 EVO1 cars (#301 - #320) for the FISA inspection end July 1982. The EVO2 (#400 - #420) was later homologated per January 1st, 1984. All the chassis destined for rally use were just drawn from the stock and taken to the special production process. For the EVO1 some cars were also renumbered ( #302 = ex 005; #320 = ex #161; #318 = ex #176; #317 = ex #153 ). The rally version (Corsa) has 16" front and 18" rear wheels, the stradale 16" front and rear. The early rally version also still had a Weber carburettor. The 1982 season would be seen as a test for contesting the 1983 season with a perfect car to win the World Rally Championship. For 1982 Markku Alen, Attillio Bettega and Adartico Vudafieri would be the factory Martini drivers and the season should be seen as a test season. Both cars retired, gear selection problems; 250 bhp carburettor. Adartico Vudafieri/Maurizzio Perissinot, no.1, Martini, TOY09061, chassis 319, 7th after gearbox troubles. As muletto chassis 318, TOY09060 was used. Attillio Bettega/Maurizzio Perissinot, no.1, Martini, chassis 198?, A6.33089, crash from 3rd place, Bettega sustained 2 broken legs. Markku Alen/Illkka Kivimaki, no.6, Martini, chassis 197?, A6.33088, 9th place. Alen used chassis 156 as muletto. Andrea Zanussi/Arnaldo Bernacchini, no.2, Jolly Club Totip, TOY09061, #319, 4th place. TOY09060, #318 was used as muletto. Markku Alen/Illkka Kivimaki, no.2, Martini, chassis 197?, A6.33088, retired after 34 stages, broken chassis. Adartico Vudafieri/Arnaldo Bernacchini, no.8, Martini, chassis 161, A6.33104, retired after 5 stages, compressor. For testing in April A6.32926 was used. Alen used chassis 156 as muletto. Andrea Zanussi/?Bernard Chenne, Jolly Club Totip, TOY09061, chassis 319, homologation troubles, allegedly over cooling system, retired head gasket. Used TOY09062, #320 (ex 161) as muletto. Fulvio Bacchelli/Spollon, no.9, Nordmende car, accident, driver thrown from car through the roof. Andrea Zanussi/Arnaldo Bernacchini, no.3, Jolly Club Totip, TOY09061,#319, now upgraded to EVO1, retired 10th stage, broken engine. EVO1 newly homologated per 1.8: new injection, different compressor, lighter body shell, 975 kg, 304hp. Andrea Zanussi/Arnaldo Bernacchini, no.3, Jolly Club Totip; not the EVO1 but TOY09058, chassis 179, retired, broken glass from rear window cut engine belts. The later remedy was to cover the glass with plastic safety film. Markku Alen/Illkka Kivimaki, no.2 without Martini-wording, chassis 317, plate TOY09059, 15" wheels and 310 bhp, retired stage 5, engine. Some time before before Alen used TOX98907, #301 (still with pre-EVO body) for testing. Alen used Red chassis 318, TOY09060 in EVO1 specification as muletto. Adartico Vudafieri/Maurizzio Perissinot, no.3, Martini, TOY21248, chassis 303 (Osella built), retired near Lyon trough distributor failure. Jean-Louis Clarr/Arnaldo Bernacchini, no.6, Martini, TOY09062, chassis 320, 3rd place. Vudafieri used chassis 314 (Osella built) and Clarr chassis 317 (=ex 153) as muletto. Andrea Zanussi did not start for his last chance of the European Championship as he was called up for National Service; he was replaced by Jean-Louis Clarr. Both cars had lots of distributor problems, the team changed a total of 5 units for both cars! Markku Alen/Illkka Kivimaki, no.2, Martini, chassis 317, TOY09059, 39 stages, engine failure. Fabrizio Tabaton/Luciano Tedeschini, no.10, Martini, TOY20776, chassis 314, 5 stages, accident. Fulvio Bacchelli/Paolo Spollon or Giuseppe Volta?, no.20, Volta, Nordmende, ( private entry), CN532053, #132, 5 stages, accident. Cesare Falco Bracco/Rosy Del Buono, no.30, Red, Ruote Nori, private car, Volta prepared, CN532264, #135, retired. Alen used chassis 318 and Tabaton chassis 156 as muletto. Markku Alen/Illkka Kivimaki, no.1, Martini, chassis 317, TOY09059, 1st place; First win! The muletto used could be (proto) chassis 005, now rebuilt as chassis 302. This rally was used as practice for the RAC Rally. Adartico Vudafieri/Maurizzio Perissinot, no.7, Martini, chassis 319, TOY09061, retired 2nd day, engine overheated. Only 6 cars finished. 1050 kg, 270 bhp at 0.6 bar. First home win for the 037, Tognana leads the Italian Championship. Markku Alen/Illkka Kivimaki, no.3, chassis 320, TOY09062, according to team manager Nino Russo had done 1 race before (Tour Auto), 4th place. 290 bhp. Lancia finished 9th in the World Championship for Makes. Andrea Zanussi, despite not finishing the season for National Service, finished 3rd in the European Rally Championship using a Fiat Abarth 131 and as from the Rally 4 Regioni the new Lancia Rally 037. Antonio Tognana/DeAntoni won the Italian Championship by using a 037 for the last 2 rallys. The target for the factory Martini Team was the 1983 World Championship for Makes. The Martini team used 11 of the Sergio Limone designed cars with Pirelli tyres. Jolly Club /Totip, 3 cars: Carlo Capone, #178, (Italian Championship), Antonella Mandelli and Massimo Biasion (both for the European Championship). Grifone / Wurth: Fabrizio Tabaton (Italian Championship) and Michele Cinotto/Sergio Cresto with R6 - sponsoring (for the European Championship), Gianfranco Cunico also did the European and Italian Championship with Wurth sponsoring. All 3 new cars, 305 bhp, 15"Frt - 16"Rr on asphalt, the reverse on snow and ice. Adartico Vudafieri/Maurizio Perissinot (1981 EC champions), no.7, TOY67910, chassis 151, 5th place. All cars had the now homologated new oil pump system. Carlo Capone and Michele Rayneri were using practice 037's for clearing the road on the third day! Lancia wins the 1983 World Rally Championship for Manufacturers. After the RAC rally (Nov 19-23) Hannu Mikkola (Audi Quattro) was confirmed as World Rally Champion. Of 21 official Lancia Martini entries in 8 championship events there were only 2 retirements (1 engine, 1 accident)! 1983 European Rally Championship for drivers. The European and Italian Championship was contested by the junior teams of Jolly Club (Totip) and Grifone (Wurth-car and R6-car), the French importer Chardonnet (Pioneer/Total) and the Volta prepared EVO1 TOY75887, #133 (Eminence). Jean Claude Andruet/Michel Roissard (Francoise Sappey? ), Chardonnet/Pioneer/Total car, no.4, 7235HX93, #313, accident, SS9; Ecuri Total, Andruet/Michel Roissard? Massimo Biasion (I) wins the 1983 European Rally Championship for Drivers (510 pts). Gianfranco Cunico 9th place (132 pts). The 1983 Italian championship was also won by Massimo Biasion (381 pts), with Gianfranco Cunico (376 pts) second and Carlo Capone (23 pts) fourth. In Germany Walter Rohrl/Christian Geistdorfer won the ADAC Rally (Sep 3/4) and came second on the ADAC Saarland Rally (Apr 8/10) with TOY09061, ch.319. The target for the factory Martini Team was the defence of the World Championship for Manufacturers, and not the Drivers. The EVO 2 was homologated on January 1 1984 with external a sharper cut-off at the back and a 2111 cc, 325 bhp engine. It would be a difficult season competing with the 4 WD Audi Quattro and the new 4 WD Peugeot 205. Jolly Club /Totip: 2 cars Massimo Biasion/Tiziano Siviero and Adartico Vudafieri/Luigi Pirollo. Antonio Rodrigues/Cotter, no.19, TOY09060, #318, rented factory car in circuit specification, retired in asphalt stages although Lancia had offered parts for gravel stages. 1984 European Rally Championship for drivers. The European and Italian Championship was contested by the junior teams of Jolly Club (Totip), Grifone (Olio Fiat) and the French importer Chardonnet (Pioneer/Total). The Volta/Eminence EVO1 car was used in practice for Bologna Corse Team with 'Tony' Fassina/Max Sghedoni and Gianfranco Cunico/Max Sghedoni in several rallys. Rally Circuit des Ardennes (B) Simon Everett/Jamar, Volta/Rizla, no.4, TOY63867, #311, retired from 2nd place with a broken driveshaft. Not a ERC rally. Jean Claude Andruet/Martine Rick, Chardonnet/TOTAL, no.4, 7235HX93, ch.313, 2nd place but excluded for illegal wheel change. At the annual press conference in December 1984 Lancia unveiled the DELTA S4, their latest rally-creation. It was expected to enter the World Rally Championship from the 1000-Lakes (end of August) onwards. Up to then the Martini 037 Rally will be used for a limited number of rallys. Updated now with wider rear wheels and 340bhp. It would again be a difficult season competing with the 4 WD Audi Quattro and the 4 WD Peugeot 205, but the priority for Lancia was developing the Delta S4 to beat the other 4WD makes. All Martini cars were new and had 325bhp. The car of Toivonen was actually the car in which he had his heavy crash, in the Costa Smeralda Rally in April, and sustained back injuries. It was rebuilt with a new rear-subframe. This was the debut World Rally Championship win for the new Delta S4, 430bhp. 1985 European Rally Championship for drivers. The European Championship was contested by the junior teams of Jolly Club (Totip), Grifone (Esso) and Tre-Gazzelle/West as well as by Snyders (Bastos) and Servia (Rothmans). The Volta, now EVO2, car TOY75887 was hired out to Tre Gazzelle in the Costa Esmeralda for practice with Preston/Lyle and took 4th place in the Liburna with Aghini/Lampugnale. Gianfranci Cunico/Piercarlo Scalvini, STARTER, no.4, TOW67780, #411, retired? Dall'Olio/Cassina, STARTER, no.16, TOW67773, #405, retired? Andrea Zanussi/Sergio Cresto, Tre Gazzelle/West, no.4, retired, engine on 2nd day. No West sponsoring on the cars. Andrea Zanussi/Sergio Cresto, Tre Gazzelle/West, no.2, 2nd place, despite broken throttle-cable on last stage, operated by hand to finish! Busseni-Ciocca, Star Racing/Piombanti-lillo, accident SS17, TO20483D, #090? 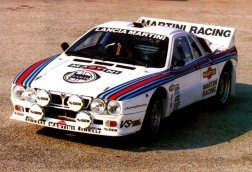 The DELTA S4, the most expensive investment Lancia had made in a rally machine, would be the Lancia Martini factory weapon for the World Rally Championship, the proven Martini Rally 037 will only be used for the Safari Rally. It would again be a difficult season competing with the 4 WD Peugeot 205and the 4 WD Audi Quattro. The Delta S4 had around 425 bhp - 45 m/kg and a weight of around 1000 kg. The factory used Pirelli tyres. After the tragic Toivonen/Cresta accident in the Tour de Corse on May 2 1986 the FIA banned the Group B cars for the 1987 WRC season and stopped further evolution models immediately. Audi Sport withdraw from the WRC after the Tour de Corse. All works teams /drivers withdraw after fatal accident to spectators on SS4. Both private cars of Criticos and Hellier were nominated as official drivers by Cesare Fiorio. The works cars had steel wheels. During testing early February, Biasion destroyed ch.187 in an 170 kph end-over-end crash. The redesigning of the front roof pillars after Bettega's fatal Corsica accident in 1985 helped saving the crew from injuries. Vic Preston's car contested the Kenya National Championship as a round-the-year development program. Fabrizio Tabaton, Michelin tyres, Esso, ran a few stages (6) for film work. Markku Alen was now leading the Drivers Championship (124 pts), but the final positions had to wait for the FISA to rule on a protest from Peugeot after its exclusion mid-way the San Remo Rally. On December 1986 the FISA scrapped the results of the San Remo, so Juha Kankkunen is the 1986 Driver Champion! The ban on Group B and the proposed Group S cars for 1987 meant that Lancia would compete in the 1987 WRC with the new Delta HF 4WD Group A car. 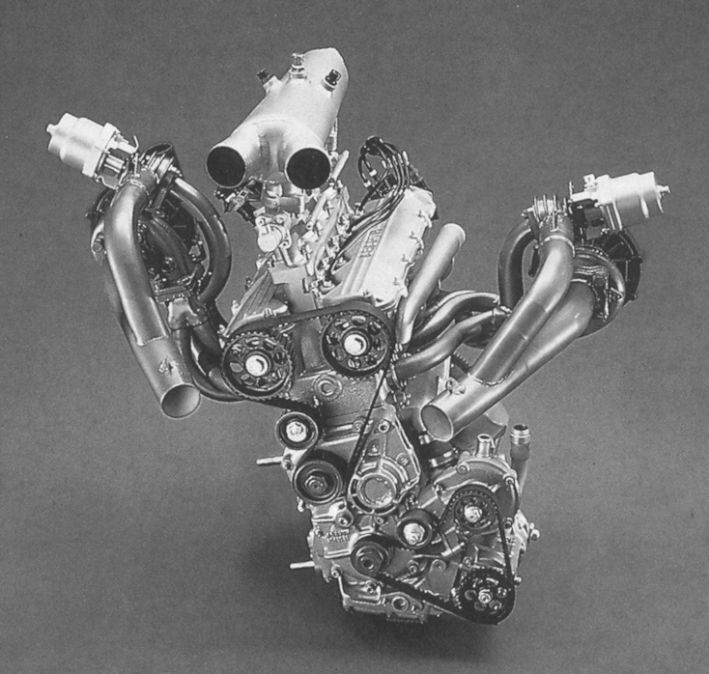 The 2 L turbo with intercooler would have 230 bhp and 5000 cars had to be made for homologation. The cancellation of Group S was a big and expensive blow to Lancia. They had a car ready, officially known as Fiat Experimental Composite Vehicle, ECV. The totally carbon fibre car, from wheel rims to roof, had a specially designed Triflux engine with twin turbochargers providing 600 bhp. However this car had been further developed into the ECV2 (1988), with a changed body and boosting even more bhp, this car is now in the Lancia Collection in Turin. 1986 European Rally Championship for drivers. The European Championship was contested by the junior teams of Jolly Club (Totip/Bendix), Grifone (Esso) and Tre-Gazzelle/West/Bastos. Patrick Snyers/Danny Colebunders, Tre Gazzelle/Bastos, no.1, TOY88745, #174, Rally 037; could not restart engine on second day (while leading). Fabrizio Tabaton/Luciano Tedeschini, Grifone/Esso, Delta S4, 1st place and EC Champion. Lancia politics found they didn't have a car for poor Patrick on the Antibes Rally when the two contenders had equal points. Of course the championship had to be won with the new Delta S4! Roger Krattiger/Reto Meier also took 1st place in both the Lugano and Baden Würtenberg rally with Nordica/Canonica sponsor. At the FISA Executive meeting, December 1986, the regulations for the European rally Championship were turned inside out in a totally unforeseen manner. Having confirmed at various meetings during 1986 that most Group B cars could compete, FISA now issued a statement that 'under no circumstances may a Group B car win a round of the European Championship and may not be able to complete the full course of the event' . So effectively 1986 was the last year a Lancia Rally 037 had competed in a rally. In 1987 however in Italy the 037's were allowed to compete in part of several rallys. Now also working on the full Italian Championship results from 1982 to 1988.